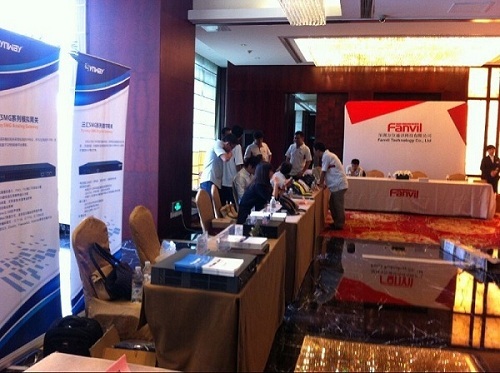 September 11th, Shanghai---Synway, a leading designer of Telecom hardware and IP communications participated in Fanvil’s new product launching seminar in Shanghai Eton Hotel with its state-of-the-art VoIP solutions. During the seminar, lots of customers and visitors paid visits to our stand and were deeply impressived by Synway’s large capacity VoIP card which is not only smart-looking but also available for 480ch concurrent calls. Together with Synway, many other major VoIP players also joined this significant event, including 3CX, New Rock, Polylink etc. We felt very honored to be invited by our strategic partner Fanvil to have such a good opportunity to learn from our peers and share each other’s valuable opinions on the current trend of VoIP technology. Fanvil Technology., Co Ltd was founded in 2002 by a couple of young engineers with a vision that IP communication will one day be a technological necessity in the workplace. True to its vision, Fanvil Technology is recognized as a top IP communication expert in China today and has sold its OEM/ODM services to over 50 countries worldwide.